Gincosan® is the best choice for those adults and elderly people who want to improve their mental performance or prevent age-related memory problems. 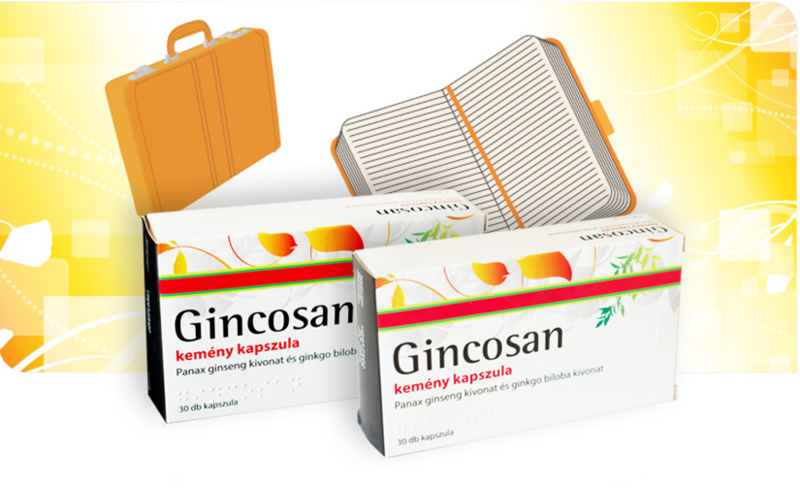 Gincosan® is a combination of extracts from ginkgo biloba and ginseng, that improves mental performance in terms of attention, concentration and memory. reduces forgetfulness and enhances memory. Other ingredients are lactose monohydrate, silicon dioxide, mannitol, magnesium stearate, spray dried glucose syrup. Capsule shell: gelatin, titanium dioxide (E171), yellow iron oxide (E172), red iron oxide (E172), purified water. Gincosan® is a unique, powerful combination of two plant extracts that actively support mental vitality in a natural way. Clinical trials have shown that the combination of ginkgo and ginseng is more effective than just ginkgo biloba extract alone. Ginkgo enhances the oxygen supply to the brain and ginseng improves its utilisation by brain cells. Gincosan® is available as hard gelatine capsules in glass bottles of 30 and blister packs of 30 and 60 pieces. 2x1 capsules per day - in the morning and at noon - after a meal. It is recommended that you take the capsule with water or other liquids.